A bit slow with my recipe posts these days, I know it. 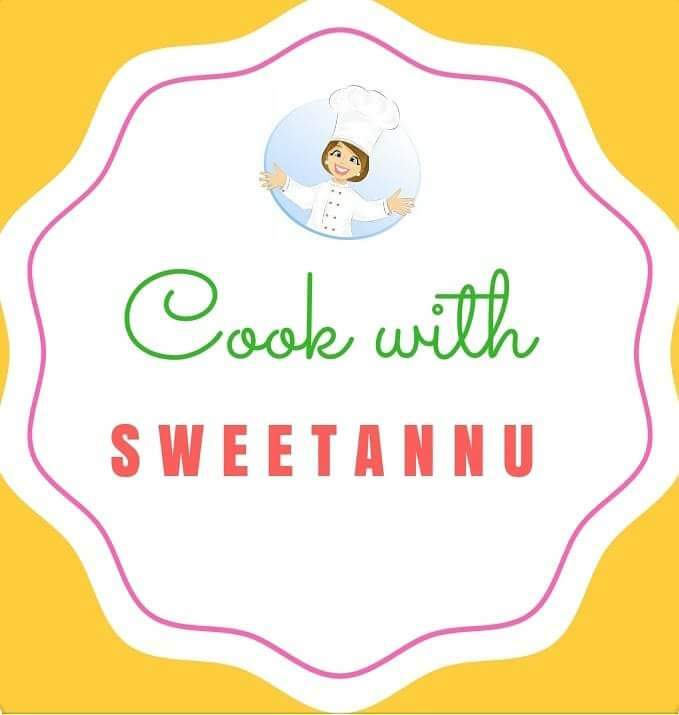 But the fact is that I have been too busy with other things and posts on my other blog site sweetannu.com . 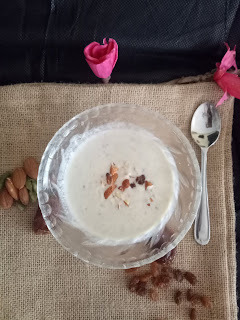 But Nonetheless today I am back with another Indian dessert recipe, low on sugar but high on nutrition and taste. Its a red pumpkin Halwa. 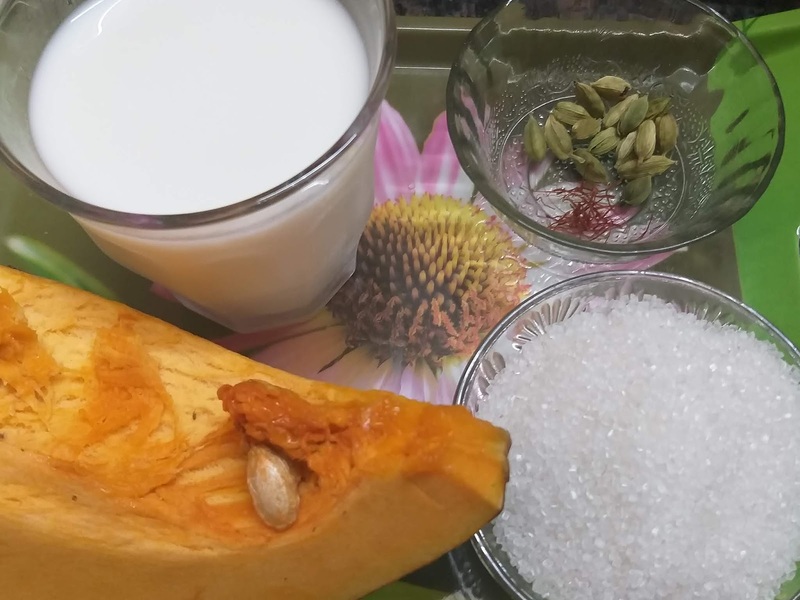 Pumpkin is better known as kaddu or bhopla in our language. It belongs to Cucurbita family like cucumbers, squash. Slightly sweet, the pumpkin is an excellent source of carotenes, minerals and antioxidants vitamins such as vitamin-A, vitamin-C, and vitamin-E. So lets not waste any more time and get into making of the recipe. 1. Grate the Pumpkin and keep aside. 2. Mix a little saffron to milk to use later in the recipe. 3. Take a heavy bottom pan/kadai. Heat up a pan, add ghee on medium heat till fragrant. 4. Now add the milk and grated pumpkin to the heated ghee. 5. Let the mixture boil till milk and pumpkin get soaked together and cook for 5-7 minutes. 6. Add the sugar and stir the mixture. 7. 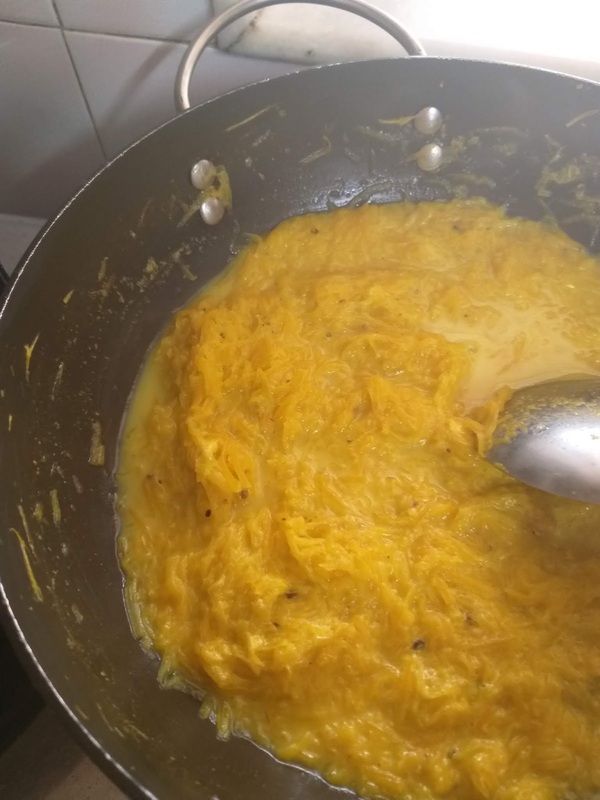 To this add the saffron milk and keep stirring. 8. Mix everything well together so that the mixture doesn't burn at the bottom. 9. 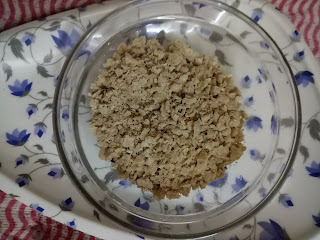 When halwa thickens up and milk dries up turn off the gas and cardamom powder. 10. 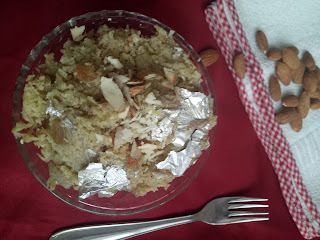 Roast the nuts and raisins in a little ghee and top the halwa with it. 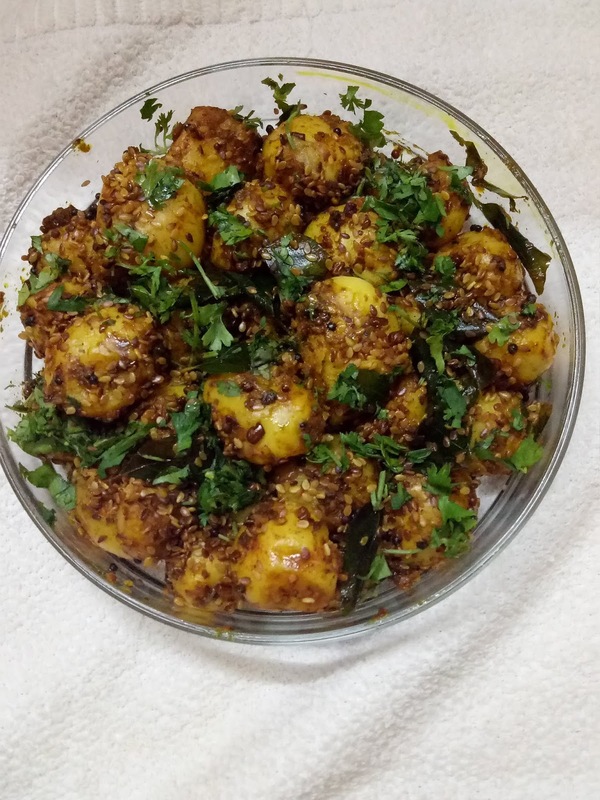 Khoya( mawa) can be used in this recipe to make it richer. You can also pressure cooker the pumpkin if you find grating the pumpkin a tedious job. Avoid sugar, use a sugar free sweetener if desired. 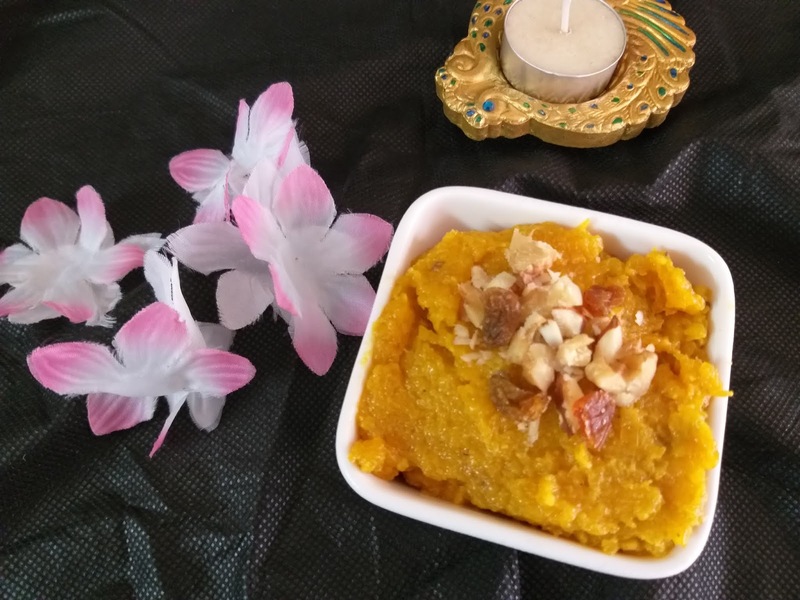 Lessen the quantity as pumpkin is a sweetish type of underground vegetable. 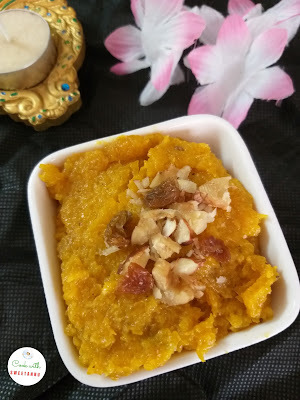 You can store the halwa in freeze for about 7-8 days. How are you doing? I know it's been a long time since I have shared an easy recipe for you all. The wait is over today. 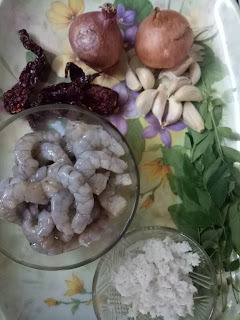 Adding to my easy Sunday cooking recipes is prawn curry. 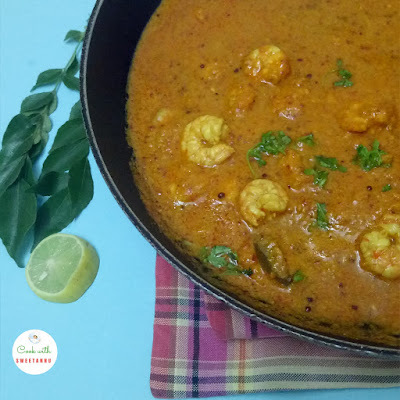 This reddish thick prawn curry is comfort food in every Parsi household. 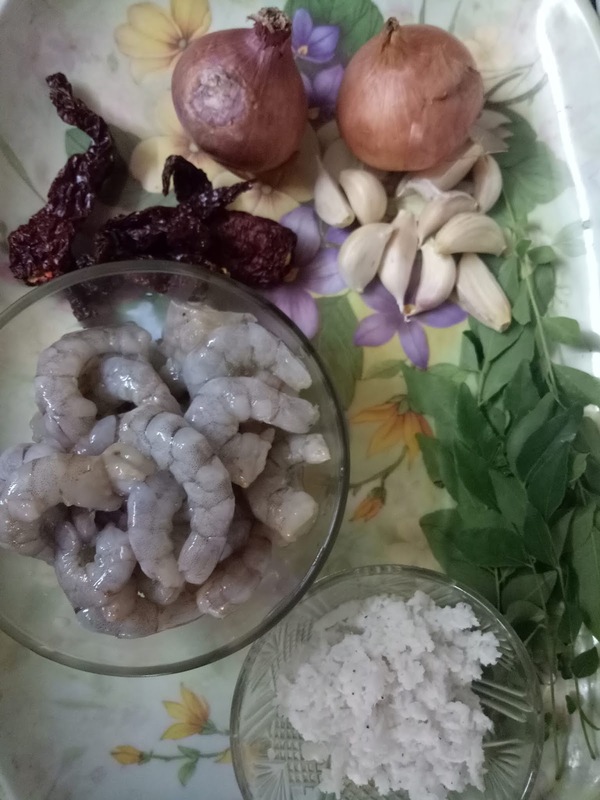 I remember my Bapaiji (grandmother) cooking up prawn curry, especially how she would wash they prawns in vinegar and channe ka atta to remore the fishy smell from it. This recipe is a different one, not the one she used to make. 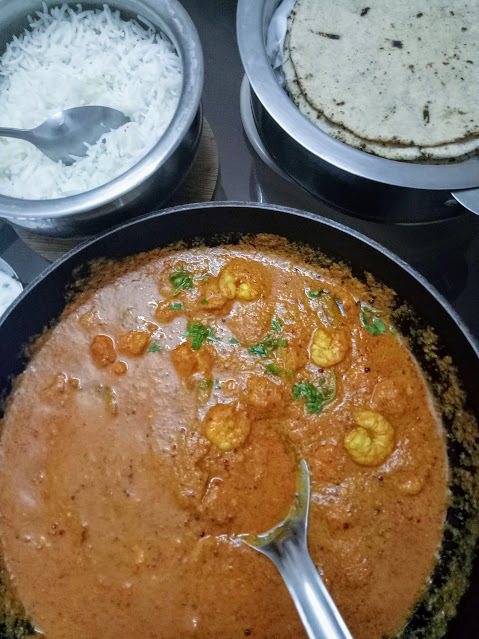 The main battle is won when you have made the curry masala. I promise to share some easy tips for you all at the end of the recipe. This is a very easy recipe for a tasty, light, flavoursome prawn curry, if you're looking for an easy Sunday. 1. Peel the shells and head from the prawns, with the pincer grip gently pull out the black thread from the opening near the head. This is called deviening. Wash it with salt water to take out the fishy smell. 2. First roast all the masalas before grinding. I do it one day before so Sunday cooking is easy. Heat oil in a large, deep frying pan. Add the onion and cook over medium heat until soft and golden. Add the garlic and ginger and cook for 1 minute. Add whole red chilies, grated coconut, dry whole spices and cook for another minute, or until fragrant. Once cool, dry grind this in a mixer- grinder adding a little water and the vinegar. 3. Take one tsp oil in a deep bottom dish, add mustard seeds and let it splutter. Tip in the ground masalas, curry leaves and bay leaves and roast for 4-5 minutes on medium flame. See that the colour of the paste changes slightly. 4. Now add the prawns and tomato to the pan and simmer for 10–15 minutes, or until the prawns are cooked and the liquid has reduced. 5. Add dry spices like turmeric powder, garam masala powder and salt at this stage. 6. Lastly stir in the coconut milk and let it simmer for two minutes. 7. 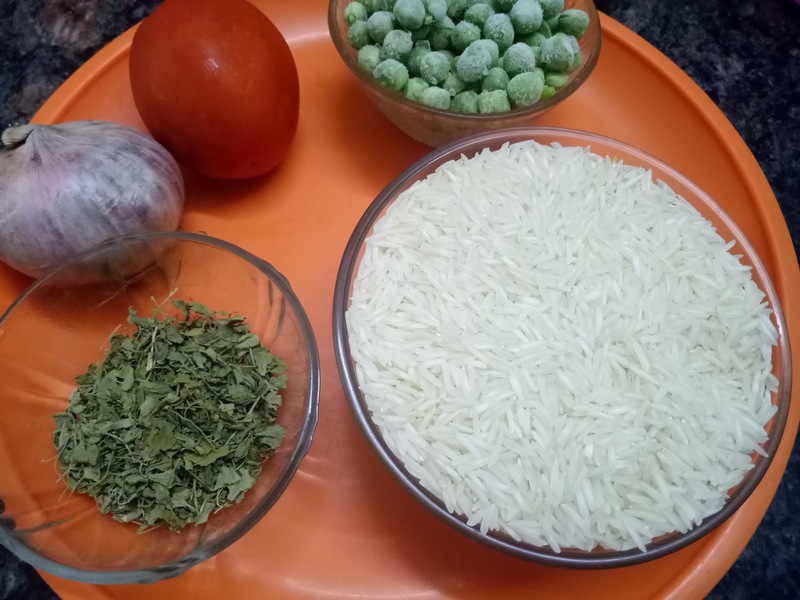 Now serve scattered with the coriander and a hot pot of steamed rice or even Jowar rotla. Slice up some onions and dont forget a dash of lime. * Prawns cook fast, if over cooked they turn rubbery. Any sized prawns will do. * You can cook the same recipe with without coconut milk. * Leave the heads of the prawns on, if desired. 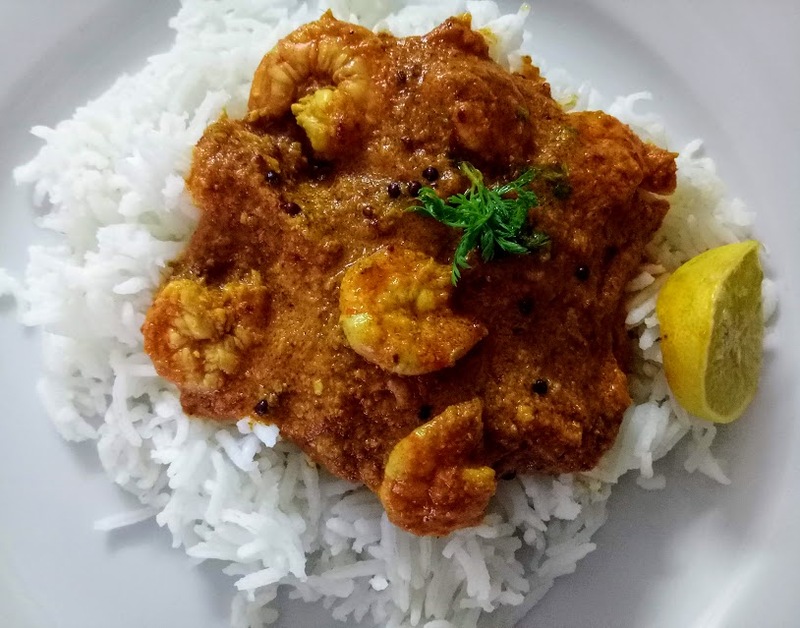 The curry gets more flavour and the dish is tastier. 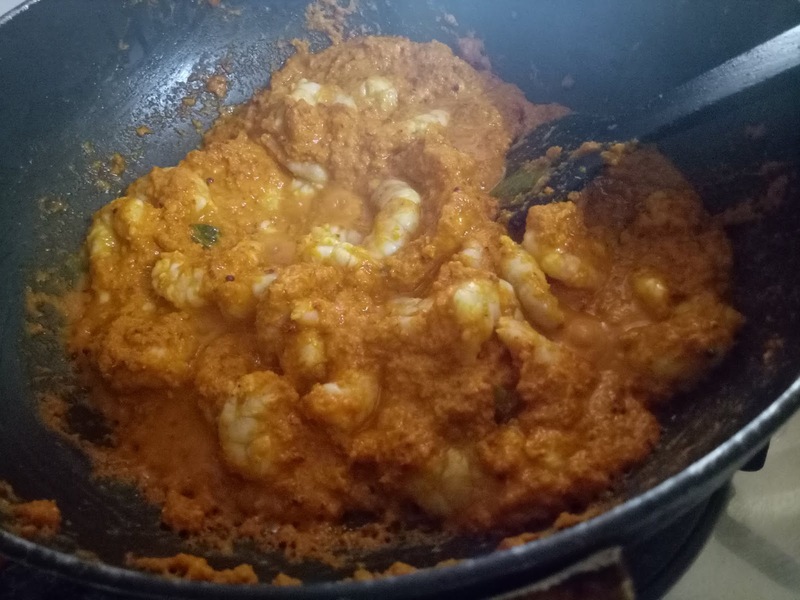 However dont serve prawns with heads if you having guests. * Make a big batch of Curry Masala. This can be prepared and stored in the deep freeze to save cooking time. 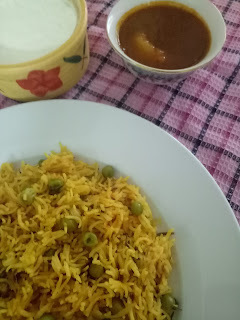 * Try tamarind and a dash of vinegar to the curry for another variation. Now all there is left is to sum up this post quickly and get back to the lunch table. I was bored of cooking up the same Akuri and French toast for Sunday breakfast. Hence today I tried to make a healthy bowl full of goodness i.e. Porridge. Porridge is a thick, warm type food especially prepared for breakfast. We all till date remember the famous fairy tale - Goldilocks and the three bears, and all about that delicious porridge. Isn't it? I made a really quick porridge ( kheer) with some easily available ingredients. The best part it that there was no added sugar in it. Instead I used natural sweeteners in the form of dates and raisins. 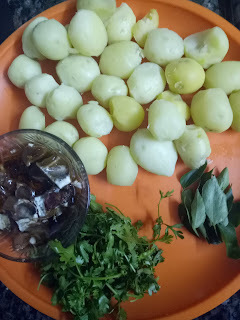 Let me also tell all my readers, that there is no right or wrong while preparing a recipe. If you feel you want to add sugar or jaggery in this recipe please go ahead and do so. These days people tend to be more health conscious than ever and want to have wholesome and healthy dishes instead. 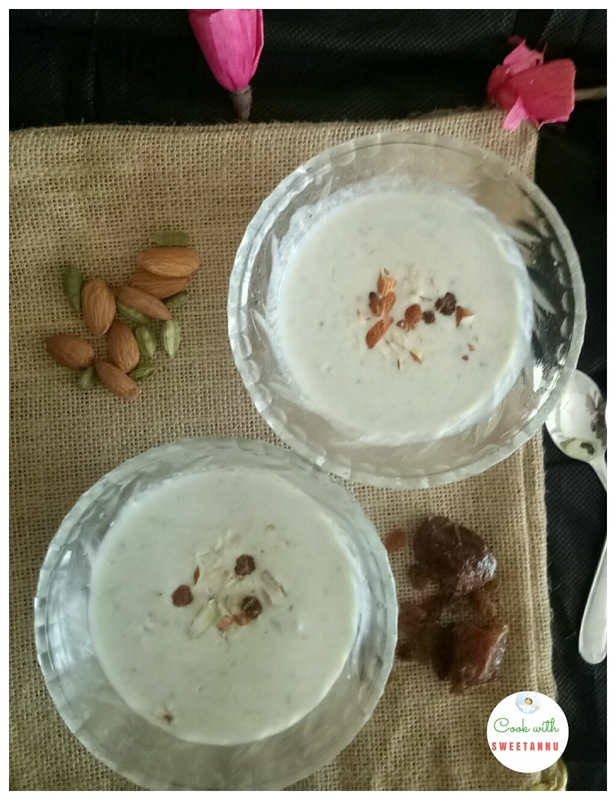 Porridge can be made with with rice, barley, oatmeal or any other grains like jowar, bajra or even millets. 1. 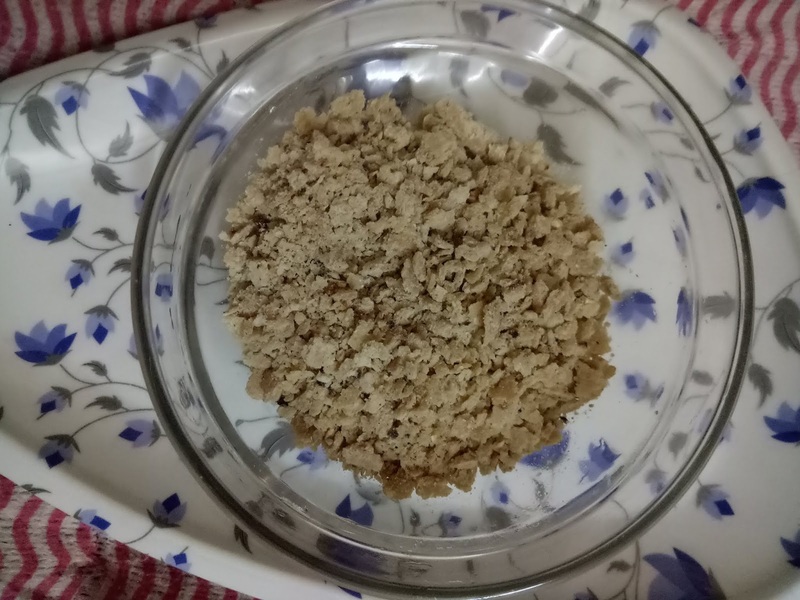 I had leftover jowar chapattis, so in a dry mixer the chapattis were ground to make powder like in the picture below. You can take grain you have at home. Make one cup of it. 2. In a medium size deep bottom pan, add the flour and half the milk to bring to a boil. Lower heat to gentle simmer. 3. Add the cardamom , cinnamon, chopped dates and raisins. Stir and cook till milk thickens. 4. Cover and leave until the consistency thickens. Add a little more milk every time the porridge's consistency thickens. 5. 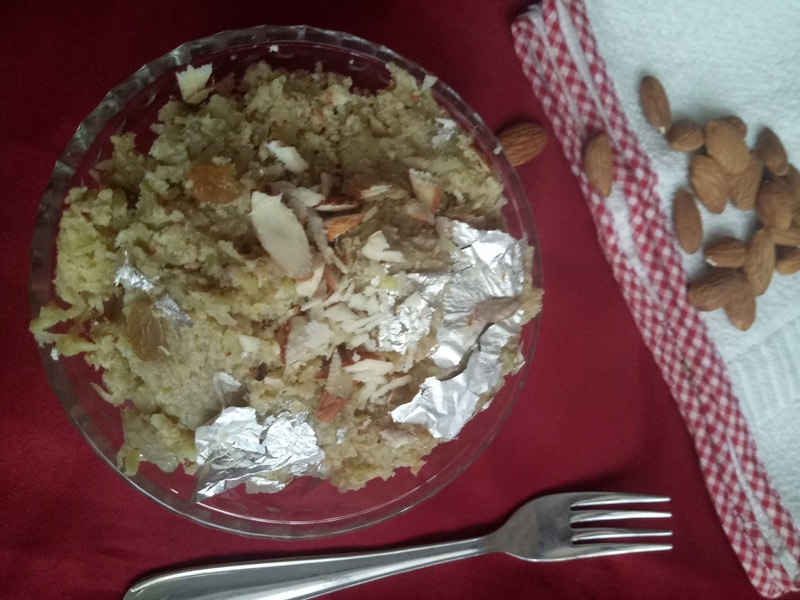 Switch off the gas and serve the porridge in bowls topped with chopped almonds. Well some like it hot, some like it cold but definitely not nine days old. 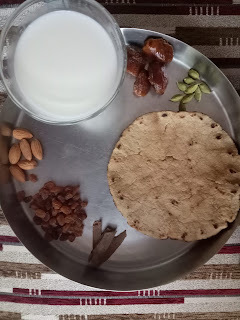 Note - Add honey to sweeten on the table but I feel we all need to develop that light sweet taste instead of an overtly sugary taste our Indian palate is used too. Happy Stirring and happy Sunday to all. I am yet to find a person who says - I hate potatoes. Potatoes are enjoyed in any dish and relished by every age group. 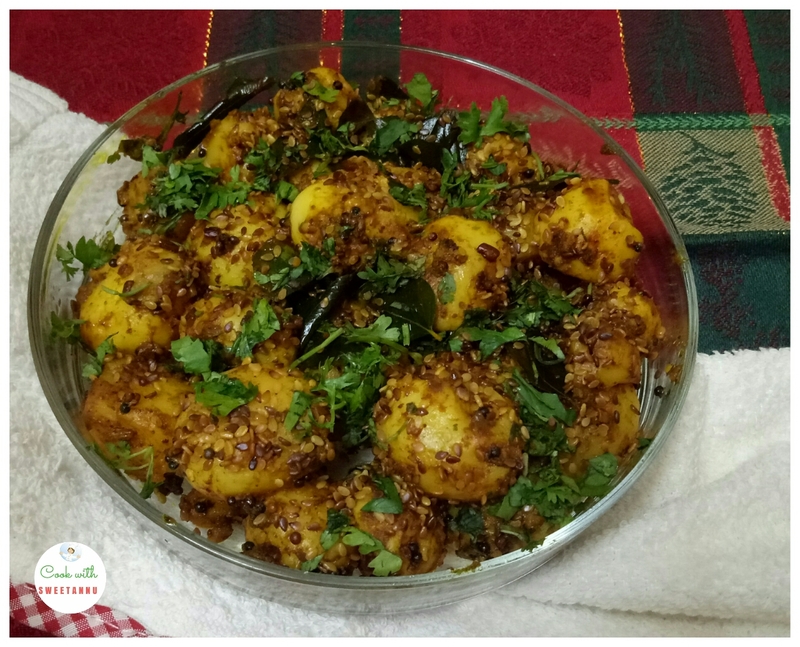 Be it frenchfries with tomato ketchep or aloo tuk with chutney, an aloo in any dish is a relish. Isnt it? This is one of my favourite forms of potato.The baby small potatoes taste sweetish and melts in the mouth. They look appealing too. This recipe is quick as well as super healthy! Today's recipe is a modified version of dum aloo with the ingredients I had a home. 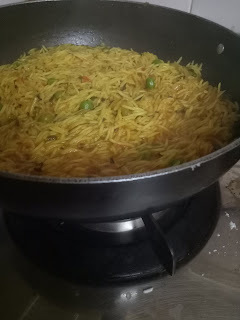 It turned out very yummy, hence I wish to share it with you. Given it the name " Til walle Aloo". If you have a better name, do share in the comments below. 1. Firstly boil and cook the baby potatoes in a pressure cooker for just 2 whistles. As they are tiny it will cook easily. Run them in cold water, the peeps will come off more easily. 2. 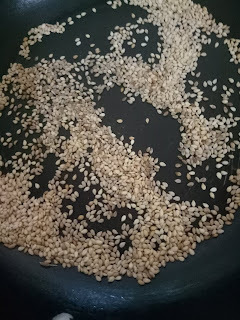 Dry roast the sesame seeds. Soak the tamarind in warm water for ten minutes or so. Squeeze and take out the pulp for using later. 3. Take a frying pan and add oil to it. On medium flame, add mustard, methi and curry leaves and let it splutter until it emits an aroma. 4. Now add the baby potatoes, turmeric and chilli powder. 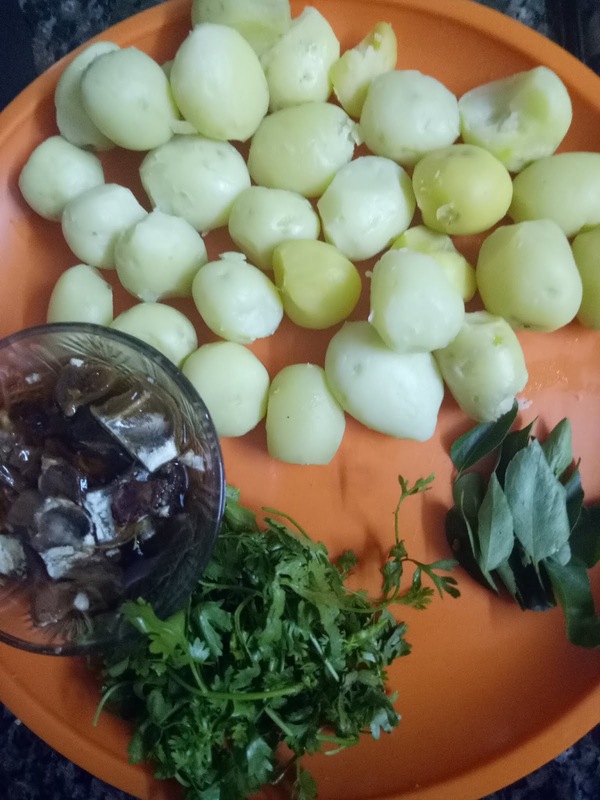 Saute till the potatoes get coated with the masalas. 5. Now add the tamarind paste and salt. Simmer on slow gas with covered lid. Let the gravy reduce and become semi dry. 6. Toss in the sesame seeds and corriander. Now switch the gas off and stir for a minute. 8. This can be an excellent dish for kitty parties. As it can be picked up with a toothpick without getting your hands dirty. If you don't have tamarind pulp add tomato puree and ketchup. You can also use regular potatoes for this dish. Add a pinch of sugar if you like the taste to be sweet/sour. You can check another aloo capsicum here. Does this happen in your household too? Some family member and yourself end up buying an item or product needed in the kitchen. This time round my husband and me bought one dozen eggs each. Haa!!! So many eggs!! And just the two of us. With two dozen eggs on hand, I quickly boiled ten of them in one go. It is going to be an eggy day ahead. Now that is the reason behind my Saturday quick lunch fix. It was boiled egg and mayo sandwich. 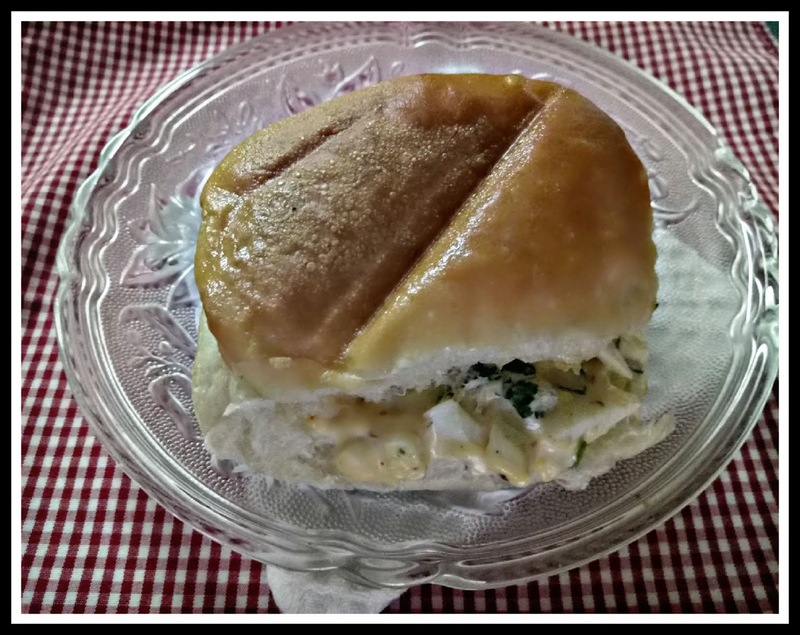 This egg mayo sandwich recipe is so easy and quick to make. 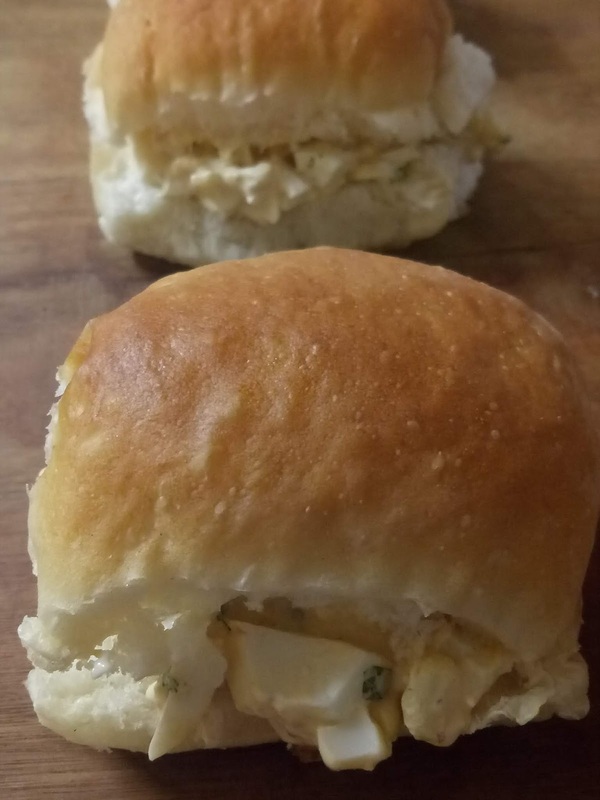 Turned out yummy, I used the filling in regular laadi pav, you can use sliced bread instead. 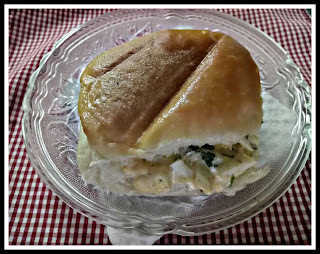 This makes a good tiffin snack or dry lunch. To make 3 sandwiches or pavs. 2 Sprinkle salt, pepper and chilli flakes and mix well. 3. Now add the mayonnaise and chopped corriander to this. Mix and mix till all ingredients combine to form a paste. 4. 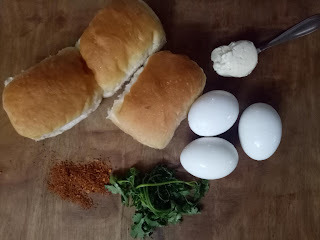 Slit the bread from the middle & place egg mixture & evenly spread. Gently press so that the batter doesn't ooze out. 5. You can eat it cold. Or then butter a pan and lightly toast it on both sides before serving. 6. Serve this immediately with tomato chilli sauce. Note - You can grill it in a toaster or oven. Add cheese to this too but that really gets heavy and takes the taste of of the egg. Cheese spread can be another option. So keep it simple, the lesser the ingredients truly enhances the taste. 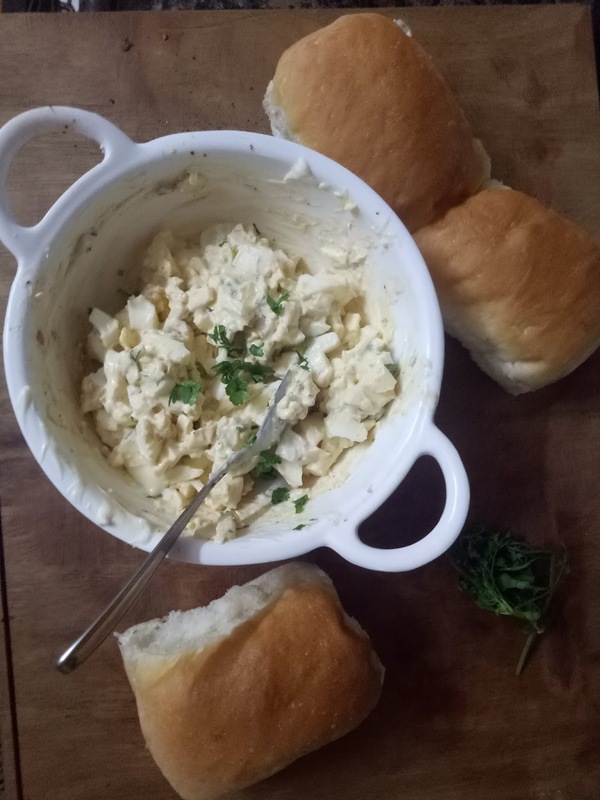 Try out another bolied egg bhurji recipe here. Sweetannu is back with another easy peasy recipe - Peas Pulao. This I stirred up in no time, at the last moment in the afternoon. I was waiting by the window for Sujata to come but when she didn't turn up I gave up. I had no option to cook up something really quickly. 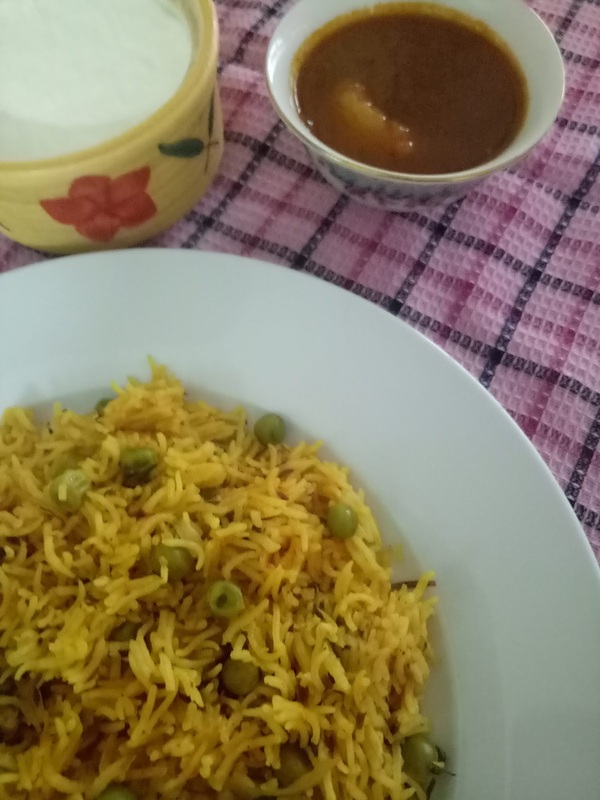 I just cooked up a peas pulao and had it all by myself. 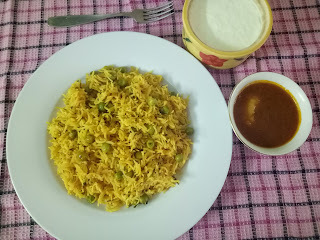 You will love it especially if you are a rice lover like me. Just a papad, pickle or have it with, ketchup, curd or some left over gravy. All these would be great accompaniments with peas pulao. Note the ingredients and method. 1. First wash and soak rice for so that cooking is faster. Also if you are using frozen peas, soak it water too. 2. Take a medium size kadai, heat oil, add a cinnamon stick and thinly sliced onion and fry quickly on medium flame till onions turn translucent. 3. Add ginger garlic paste and saute till they lose the rawness. 4. Now add the chopped tomato and dry spices. 5. Add the peas to this and gently give it a stir for 30 seconds. 6. Now drain the water from rice and add to this. Cook on a medium flame till the rice starts to cook and gives out a nice aroma. 7. Add kasturi methi at this stage. 8. Add one cup water such as it covers the rice completely. 9. Cook till rice is done. 10. Cover and cook for best quick results. 11. 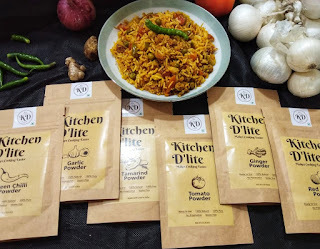 Serve it hot with accompaniment of your choice. For the fastest results Pressure cook on high flame for 4 whistles with two cups water.